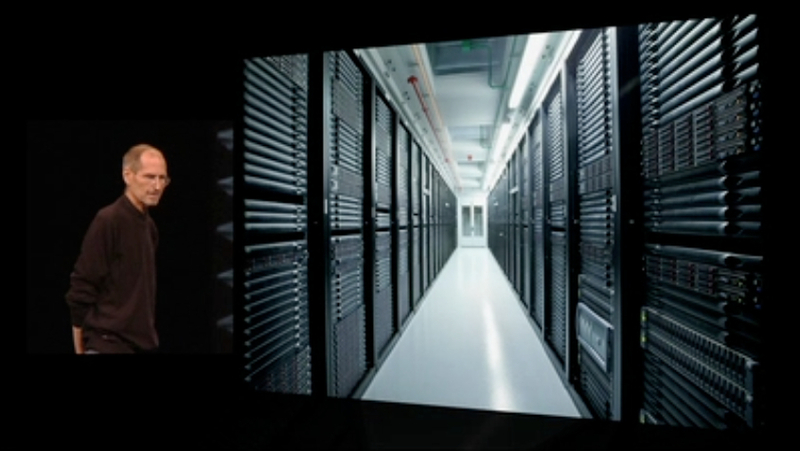 It’s full of HP (s hpq) servers. Storage analyst Stephen Foskett and ZDNet Editor-in-Chief Larry Dignan both noted as much, even going into some detail on models and specifications. 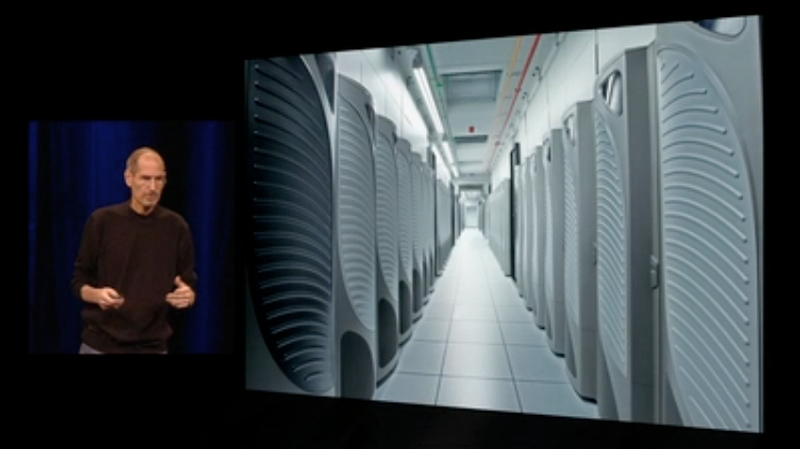 Both suggest Apple bought a large number of HP’s commodity ProLiant DL 300 series boxes. This shouldn’t surprise anyone. I spoke with HP Vice President of Industry Standard Servers and Software recently, and he explained to me just how prevalent HP gear is among the world’s largest web sites, search engines and social media sites. He also highlighted HP’s major partnership role in helping Facebook design its cutting-edge data center and servers. Certainly, HP has the cloudscale chops to be part of Apple’s cloud foray. The Global Business Intelligence (GBI( team within Apple’s Information Systems and Technology (IS&T) organization is implementing a 250+ terabyte database to support analytical and reporting needs of hundreds of global Apple users. To drive this effort, GBI is looking for a senior architect with expertise in designing and implementing big data solutions using technologies like Hadoop, Teradata, Memcache, Casandra, Informatica and Java. . . . The ideal candidate will have a bachelors degree in computer science and seven or more years experience with at least three of them being on big data, NoSQL platforms like Hadoop using Hive and HBase. A good understanding of relational databases is required. Experience with MPP databases like Teradata, ETL tools like Informatica, and BI tools like Business Objects will be a big plus. Earlier job listings from Apple suggest that it’s using Hadoop, as well as other advanced analytics techniques for improving the iAds mobile-advertising platform and iOS, so there’s no guarantee that Apple has all that Teradata gear solely for storing personal data that it ultimately wants to sell. Maybe there’s some NetApp (s ntap) in there, as well. Foskett thinks he spotted a variety of NetApp storage products in Apple’s data center, which is somewhat interesting because Apple reportedly bought 12 petabytes of Isilon file storage from NetApp rival EMC (s emc). Of course, there’s no requirement that Apple go single-vendor across its storage infrastructure and, in fact, Apple customers might take solace in the fact that it appears to have gone best-of-breed for its various storage needs. What’s certain is that Apple didn’t approach its iCloud infrastructure build with a light wallet or the mindset that it has to build its own gear and software like Google (s goog) and Facebook have done. As Jobs said during his keynote, “It’s full of stuff. Full of expensive stuff.” Indeed, it cost Apple $500 $1 billion. Apple’s customers can complain about iCloud’s features, but it doesn’t look like they complain too much about Apple’s investment in the infrastructure that supports it. Love Apple’s new Cloud Computing service! Thanks for sharing! I found the comment regarding being one of the most eco friendly data centres interesting, particularly as apple are under a bit of eco pressure at the moment and they didn’t offer up any specifics! Although to be fair this isn’t the main interest of the audience, but it would still be nice to know! Apple is building its own search engine. And I thought they’d daisy-chained a bunch of Mac Minis together. This is where they store skynet, right? The entire tech industry knew Apple got rid of XServe when Apple announced it..
Typo — It cost $500 Billion?